I have four kids. Each year, they each get to request a birthday cake they would like me to make for them. They pick the theme, but I pick the details. They trust that the cake-making decisions I make will result in an amazing cake for them. 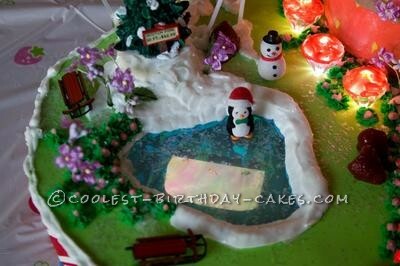 When I decorate these cakes, I am able to create whatever is in my mind – my own perception of the theme. And my kids know that I tend to go “all out” for these cakes. Why do I do this? Because I love to see my kids’ faces when they see the creations I come up with. I love seeing their excitement and anticipation, and creating these memories with them. So I had Trinity’s request: a Strawberry Shortcake cake. A few days before her birthday I got started. Creating the cake is easy; it’s the figuring out what I’m going to make that is the hard part! I started with an image search on Google for everything from Strawberry Shortcake figurines to Strawberry Shortcake cakes. I will never copy a cake exactly, but I will get inspired by aspects of what some others have done. I will usually start by printing out about 15 different images to look at and put together for my cake. In my research I saw one cake that looked like a village, and I decided to use that concept. Being an electrician by trade, I decided that my creation needed electrical lighting. In order to make this happen, I started by making a cardboard base. This made it possible for the walkway of what became Trinity’s Strawberry Shortcake Winter Wonderland Village to be equipped with battery-operated red globe lights, and for me to place six diamond-shaped strawberry light-up bushes right next to the strawberry house. Oh, and you can’t forget the strawberry pond filled with real strawberry filling and “magical” lighted strawberries! Using a cardboard base also made it possible for the fish pond to feature swimming fish – compliments of a “swimming fish” program on my iPhone (which was taped to the bottom of the plastic DVD cover I used to create the ice on the pond). White snow frosting surrounded the pond and house, and edible snowflakes filled the grounds. The cake portion of my creation was the strawberry-shaped house in the center of the village. The house had a solid chocolate front door and a roof made of inedible floral leaves. Leading up to the house was a mosaic pathway made of hand-broken and placed Necco candies mortared down with frosting. Other details included candy frosting flowers, a candy sucker forest and some plastic characters and Christmas tree. I used to be a general contractor who built houses, but on this project I got to use edible materials to build a strawberry house for my little girl. 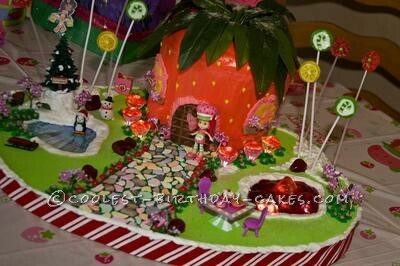 I think that if I were in a Strawberry Shortcake village, this cake is what it would look like! Trinity’s Strawberry Shortcake cake took a full day to create, and Trinity absolutely loved it! Her siblings loved it as well, although I think they were even more excited for how Trinity felt. I have seen that every year each of my kids are very excited about seeing the reaction of the sibling that is receiving the cake. After the cake was eaten we left the village on the table for the week, and Trinity enjoyed playing with Strawberry Shortcake in the village until the village had to go bye-bye.